On February 1, LGBT groups will once again march in the Vietnamese New Year parade in Orange County, California’s “Little Saigon.” After last year’s failed court battle to participate in the “Tet” parade, this year’s win by LGBT groups is more impressive because it comes from a 51-36 vote of Vietnamese American and other local representatives. It’s a reminder that while courts of law are important for recognizing equal rights, true LBGT inclusion also requires winning over courts of public opinion in the community. Tet is the Vietnamese New Year festival, based on the same lunar calendar that triggers the Chinese New Year. As immigrants from Vietnam living in the United States, ever since I was a little kid, my family still celebrated Tet as the most important holiday of the year. So too do the many other Vietnamese Americans living in Westminster and surrounding Southern California cities that form “Little Saigon.” For them, the annual Tet festivities and parade in Little Saigon are some of the most visible community events. That visibility is why it is so valuable for LGBT groups to march in the Tet parade – which they did beginning in 2010 while the parade was organized by the City of Westminster. But last year, the Vietnamese American Federation of Southern California took over when the city could no longer afford to host the parade. That private coalition argued that it was not bound to follow nondiscrimination laws and denied LGBT groups’ application to participate – using the rationale that being gay “is not part of the Vietnamese culture.” A court battle ensued, which the LGBT groups lost. 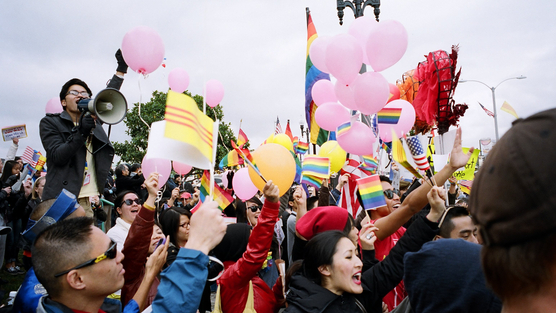 For 2014, the Viet Rainbow of Orange County organization formed to renew the fight. It marshaled media coverage, another online petition on Change.org and support from LGBT organizations such as GLAAD. Still, last November, the private federation members voted against allowing LGBT groups to participate. The Westminster City Council urged efforts to find a compromise. That led to a civic assembly this past Saturday, where community representatives voted. The balloting resulted in a win for inclusion of LGBT groups in this year’s parade. That this victory comes from a community vote – rather than a court ruling – is significant. Especially because I am a lawyer, I believe in the judicial system’s role to protect the rights of minorities; indeed, it often takes court decisions (rightfully so) to confer equality. But a victory by community ballot shows that LGBT groups were able to move the needle on public opinion – even if the needle moved reluctantly under pressure. That makes it harder for opponents to criticize the result as the act of a single or small number of “activist” judges – the mantra that is so often repeated when a court rules for equality. Moreover, what LGBT Vietnamese Americans need is not just equality of rights, but actual inclusion in their own community. In all races and ethnic groups, it’s not easy to be gay. But I can tell you from my own personal experience that it’s especially challenging when you are raised in an Asian – and especially Vietnamese – conservative culture, where pushing a child to academic success is often more important than encouraging self-expression. After years of feeling they must hide, LGBTs need to be seen in the everyday fabric of Vietnamese American life. In my own family, such everyday integration has led to poignant progress. After accepting some years ago that I am gay, my mom has now moved to the point of changing her egg roll filling from pork to ground chicken because my boyfriend Neil is Jewish. For moments of LGBT progress – big and small – to happen, it takes gay people being visible and integrated. That’s why being invited back to the Tet parade by members of their own community is a bigger step towards true inclusion of LGBT people in Little Saigon than a court victory alone could achieve. Finally, the community vote renews my faith in the ideals that brought Vietnamese immigrants to America in the first place. Like so many other refugees from South Vietnam, my parents fled to escape the Communist regime of North Vietnam. My mom and dad wanted a country where they and their children could have freedom and opportunity. My father, who was a judge in South Vietnam, often reminds me that America is the greatest country in the world because, here, you can be and say what you want. That’s why I was so disappointed last year when I wrote about my fellow Vietnamese Americans’ decision to exclude LGBTs from the Tet celebration. Of all people, Vietnamese refugees should remember the importance of tolerance and accepting people who are different. But thanks to this year’s reversal, I’ll forgive the lapse of judgment and hope that Vietnamese Americans will continue to advance – rather than retreat from – the ideals of America. Meanwhile, I can’t wait for the return of rainbow flags and LGBT pride at this year’s Tet parade in Little Saigon. It will be a true community win.